Yesterday Bo had a day off, so what do we do? What else, we went fly fishing. We launched at Lobo Landing and without even cranking up the jet Bo started firing streamers. Not a hundred yards below the ramp Bo locked up on a nice Walleye. The fly was a #8 Chuck’s Chunk on a 6wt. Sage rod. The Walleye probably thought the fly was a baby Brown Trout as Walleye are voracious feeders of Brown Trout and even though we release all our fish this boy was not going back into the river. We motored back up to the dock at Lobo Landing and the guys working the dock were thrilled to get a fresh Walleye for lunch. Bo caught several more Rainbows on the streamer and about mid morning switched to a #16 golden tan Sowbug. The fishing was just silly good! On one stretch it was twelve casts and twelve Rainbows. By 1:00pm Bo was tired of catching trout so we had little river lunch and just watched the world flow by. About an hour later the water came up and it was really off color so after a few more Rainbows we cranked up and headed for the ramp. 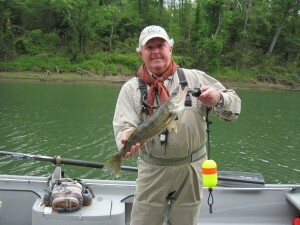 Wish we could have had some clients with us to enjoy are really amazing day on the river. 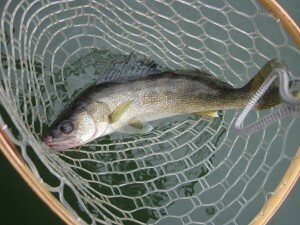 Book your trip with Empty Creel Fly fishing Guides & Outfitter and we will try to find you a Walleye on fly.